This Impact Punch Down Tool with 110 Blade inserts and cuts cable terminations effortlessly. It has an adjustable high/low actuation setting that accommodates termination requirements or operator preference. There is a storage compartment with a unique locking device which provides convenient storage for spare blades. This tool is equipped with an impact absorbing, cushioned grip that reduces operator stress for high volume installers. 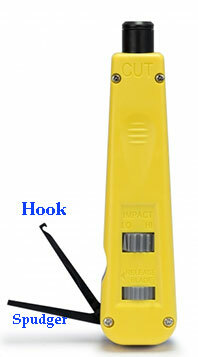 It is compatible and interchangeable with many other leading impact punch down tools on the market.